Sports betting online is extremely popular, but unless you know what you’re doing, you are at a slight disadvantage—even if you are a huge sports fan. This happens because on bets that the casino thinks are equal in value, you must pay 10 percent more than the bet is actually worth. You’ve probably seen this before but might not have paid it much attention. Let’s look at a quick example to illustrate what this disadvantage looks like in reality. What this basically means is that the Vikings are expected to win by an average of 2.5 points over a large sample size of trials of this particular game. If they win by 2 or fewer points, the bet would be in favor of the Bills—this concept is called the “spread.” The bigger number refers to what you have to bet in order to win $100. So if you want to make $100, you would have to put $110 at risk. This might seem like a bad bet when you look at it this way. Much of the time, this would be true. But suppose you do the math and you find that the Bills really are at an advantage for this game. In fact, you’ve found that they have a 55 percent chance of beating the spread, or in other words they will lose by two or fewer points, or win. When their real odds of winning are at 55 percent, the real payout should be at -122 (betting $122 to win $100), so if you were to make this bet, you would have what is called an overlay—your payout is more favorable than the actual odds of this occurring. This is one of the most important concepts in sports betting, and if you can consistently spot these overlays, you will be a winning bettor. The 12 point overlay will add up over time, so even if you lose your first several bets, if you are accurate in pointing to the real odds, finding these overlays will add up to a tidy profit. This is much easier said than done. If you are thinking that the Bills will lose by fewer than 2.5 points, how do you come up with a percentage of how often you think this will occur. There are a lot of factors to put together in order to form this picture, and it’s impossible to be accurate 100 percent of the time, but looking at projections and past results of teams in similar situations will help you to figure this out. Eventually, you will be able to improve your accuracy to a point you feel comfortable with. Remember, this is an inexact science, so you will lose from time to time. The object here, however, is to win more than you lose. Proper money management—putting more money on the bets you are more confident with—will also help you toward this end. If you want to try this for yourself, check out Bovada Sportsbook. 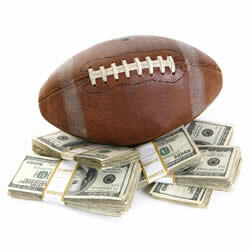 They are US friendly and offer some of the best odds in sports betting. Tagged with Gambling, overlays, sports, sports betting. Headed for Vegas or any other casino for that matter? One thing you’ll ask all your friends and relatives that have been there is, “What games have the best odds?” Ask 10 people and you will get 10 different answers. It’s not a matter of what games have the best odds. It’s all a matter of knowing the rules and honing in on your skills. Poker. This is a game of skill and wits. It’s got the best odds as you can bluff a player into folding and you make more money this way. The house advantage is almost nothing because they don’t take anything other than a small portion of pot. Video Poker. If playing against another person or group of people and trying to read them doesn’t appeal to you, then you can try your luck against a machine. The house takes about a half percent and if you get lucky you can win on some machines, up to 100% of your money back and even more at times. This is pretty fun and if you play it right, you can make quite a bit of money. Blackjack. This is a very straight forward game. Your goal is to get 21 without going over and the dealer has to go 17 or higher. So it seems the chances are that you will win almost every time right? Well, not so with this one game. Unless you apply the “basic strategy” which is you make the best move every game, then you can find yourself on the losing end very quickly. If you do apply yourself to making the right decisions you can make your money and more just as quickly. But the one exception to this is, if you lose, the house gets all your money and you end up with nothing. Craps. This dice game rides solely on the person who is throwing the dice. You place your bets on what you think they will throw. With this game you place your bets on numbers and then you can also place them on the Passline/Come or the Don’t Pass/Don’t Come spaces. You lower the house odds in these particular spaces but can bring the house odd even lower to under a single percentage when you double your odds. It’s again all dependent on the dice thrower. So wish them luck. Pai Gow Banker. In this game, a player can choose to be the banker while playing. While being the banker, you pay a 5% commission to the house, but you win the bet of any player you beat while playing. So the odds are in your favor if you play those who are not as familiar with the game. The commission is paid when you end your role of being the banker. So with all the information that was included in the previous five tips, the house does get something out of almost every hand or game you play. After all, the casino wouldn’t be in operation very long if it paid out as much as it brought in. That sounds nice, but it’s just not going to happen. So make sure you bet wisely, and never bet more than what you can afford to lose. If you finish playing and you have come out a winner, then feel lucky as more people leave with a loss than coming out ahead. And always make sure to gamble responsibly. If you feel like an addiction is creeping up, seek professional help. Now go have fun and good luck! There are many fun things to do in a casino and if you feel you have a hot hand, then one of the more challenging, but also one of the more profitable ways is dice. The roll of your hand, throwing the dice out, hoping that you get that lucky number, there is always something about the thrill of watching them fly away from you. Add in the excitement factor of people standing around you, having placed bets on what you will roll, and you have a very unique and exciting experience. The most commonly played game that uses dice at a casino is called Craps. This game is the one where you would see people standing around a large oval table and also where usually the loudest cheers are coming from. 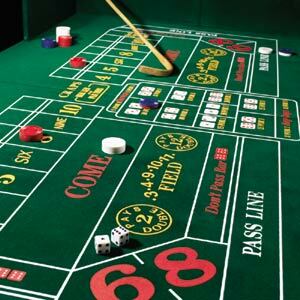 To many, craps seems like it’s confusing but it’s actually much simpler to play than many other games. It is, however, one of the most hands-on experiences you can have at any casino so that entices many to its sides. To get an understanding of this wonderful dice game, a few of the bets you can place to get started with would be the Pass Line Bet or Odds Bet. To simplify what a pass line bet is, it is where you place a bet on the pass line before any new shooter begins his dice throw or roll. This is also known as the come out roll. If the shooter rolls a 7 or 11 you win, but if they roll a 2, 3, or even 12, you lose. Any other number becomes what is called the point number. Are you confused yet? If so, then let’s rephrase the instructions. If a shooter throws the dice and gets a 7 or 11 you win money. But you lose money if it’s a 2, 3, or 12. If they roll any other number they must throw the dice again and get the exact same number to keep being the shooter. Also you win money on the pass line bet if this happens. However, if the shooter rolls anything else other than that exact number on the next roll, they are no longer the shooter, and the dice are passed on to the next shooter. Then the whole process starts over. With the Odds Bet, you can place additional bets other than the Passline Bet. But only after the point has been established by the shooter can this be done. The benefit to a pass line bet is that it is the only bet that the casino doesn’t have a house edge as it is paid off with actual odds. The most fun part of craps is that many casinos offer double odds, and that means you can place double the wager on your pass line bet. In simpler terms, you bet $25 on the pass line, you can now wager $50 on the odds bet. Pretty cool, right? It is when you know what the odds bet pays out. If the point total on both dice is either a 4 or 10 it will pay 2 to 1. If the point total on both dice is either a 5 or 9 it will pay 3 to 2. If the point total on both dice is either a 6 or 8 it will pay 6 to 5. The Passline Bet is the easiest way to get into the game of craps and it’s easy to learn. Many of the casinos actually will give lessons on how to play the game and will give instruction on the basics and will even teach you some of the table etiquette. So when you approach that table, not only will you feel comfortable, but you can also go up there and show them your dice-throwing skill. Craps is also a game that you can play on your mobile phone for REAL money. Be sure to visit mobile gambling offers to get a good deal before signing up anywhere. With this knowledge, go show the players that you mean business and that you know what you are doing. It’s fun, exciting, and the thrill of the dice leaving your hand is unmatched. May the dice land in your favor and may you cheer the shooter on like never before. Happy Craps!